This section shows the entirety of CanberraUAV’s 2014 S&R UAV setup, for both the ground station and UAV. 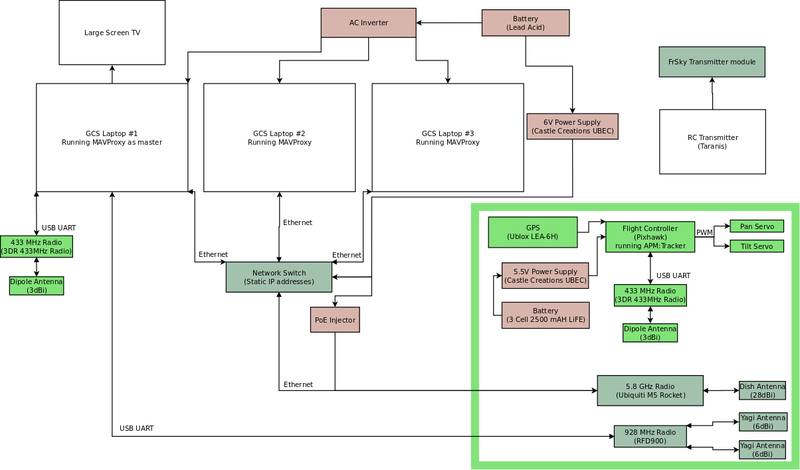 The different sections are colour coded according to their function and, where application, the interface/protocol connecting the systems is mentioned. The airframe itself is VQ Porter RC aircraft. It is simple to build and easy to transport. There is plenty of room inside the airframe to install equipment too. Wingspan is 2.5m and takeoff weight approximately 12kg. The servos used were high-powered digital servos, with plenty of overhead (in terms of power) to control the flight surfaces. Each control surface only had one servo – it was felt that adding “backup” servos to the control surfaces would over-complicate the UAV and introduce further points of failure than it would negate. The engine is a 35cc DLE engine, fitted with a 22×11 propeller. There was no engine monitoring coming back from the engine – if the engine failed in mid-flight this would quickly become apparent by the reduction in airspeed. Due to RFI from the engine, other radio sensitive equipment was placed well away from it. The engine did not have a electrical power generator fitted, as the already fitted LiFE batteries supplied more than enough power for 1 flight. Also, if the engine failed, electrical power was necessary to glide the UAV back to a landing. The header tank was a small intermediate fuel tank (100ml) that prevented air bubbles getting into the engine and stalling the engine mid-flight. The fuel tank was a standard 2.7L tank fitted at the centre of gravity of the airframe. Thus the centre of gravity would not change significantly during the flight as the fuel tank emptied. There was no feedback as to the level of fuel in the tank during flight. The 90 minute flying time of the UAV was extrapolated from the amount of fuel used in a 30 minute flight. Two 2500mAh LiFE batteries provide all electrical power for the duration of the flight. They are connected in parallel so that if one battery fails, the other can continue to supply power. They are checked before each flight to ensure they are fully charged. The three power switches control the supply of power to the 3 major systems on the UAV. First is avionics, which supplies power to the flight controller, On-board computer, radios and cameras. The second is the servo power supply, which allows power to all servos – and by extension the flight control surfaces. The third is the engine ignition. As the name suggests, it powers the ignition on the engine. The reason for these three circuits is safety. For debugging the UAV systems, just the avionics circuit needs to be powered – the engine and servos and completely de-energised. There is no chance of these two systems powering up and potentially injuring someone. It is also useful that the “high powered” devices (the servos) are on a different circuit to the “low power” (avionics) devices. Any voltage drops or harmonics generated by the servos will not affect the sensitive electronics on the avionics circuit. This battery is 4x AA NiMh batteries that supply power to the ignition system of the engine. These convert the ~12V battery power to a stable 5.5V. Though the electronics works at 5V, the extra 0.5V allows for any voltage drop due to a high current draw. Each power supply is good for up to 10A. Voltage drop has been an issue in the past, as some power supplies that claim to operate a 5V tend to operate closer to 4.7V, and down to 4.5V under load. At 4.5V, some electronics will experience a brown-out, leading to abnormal operation of the electronics. These power supplies are the Castle Creations CC BEC, which is a high quality power supply. Due to the 5.8 GHz radio requiring it’s power supply via PoE, an injector was needed. This power supply is specific to the Pixhawk flight controller and provides a stable and clean 5V power for the Pixhawk flight controller. It also monitors both the input and output voltages. Due to this and 5.5V servo power supply both connected to the Pixhawk, it is able to switch to the servo power circuit if the 3DR Power Brick fails. Thus the flight controller has power supply redundancy. The flight controller is a 3DR Pixhawk running the APM:Plane software. Both hardware and software are open-source with regular updates and new versions. It is worth staying up to date with new versions of the flight software, as they can sometimes fix critical bugs in the software. The GPS modules are based on the uBlox LEA-6H series. Although this series is not the newest, the LEA-6H is a reasonably accurate and reliable module. Combined with the inertial sensors and compass module, the APM:Plane can generally refine it’s position down to ~2m accuracy. There are two GPS modules to lower the chance of a total loss of GPS position. 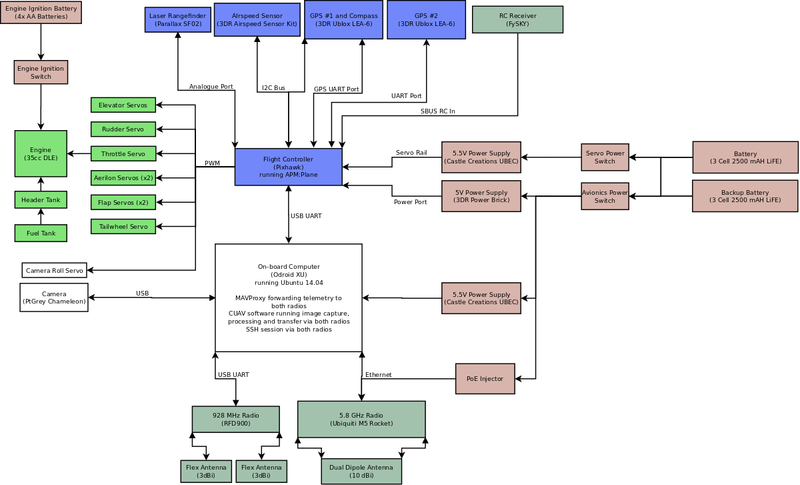 The compass is integrated on the aforementioned GPS modules, but connects via an additional cable (it uses the I2C bus, rather than the UART that the GPS modules use). It should be noted that only the compass on GPS #1 is used. The Pixhawk has it’s own internal compass as a backup. As with all magnetically-based sensors, this module should be placed well away from any magnetic sources – such as engines, motors, etc. This module is mounted on the wing of the UAV (well away from any prop wash). It provides velocity information to the flight controller. It is important to note that it does require calibration before each flight, as it needs a baseline air pressure. The Laser rangefinder is only used for the automatic landing sequence, where an accurate altitude above ground measurement is critical. The specific one used here has a range on 40m, so cannot be used during the cruise portion of the flight, where the UAV’s altitude is usually around 100m. If an automatic landing is not required, this module is not absolutely necessary to the UAV. The RC receiver is a standard RC type (a FrSKY to be specific) that operates at 2.4 GHz. It allows the pilot to take over manually during takeoff, landing, or whenever the UAV is close by. It is also useful for pre-flight tests, to ensure all the servos and flight control surfaces are working as expected. This radio is an RFD900, operating in the 915-928MHz band (allowable bands may vary slightly in different countries). This transmits MAVLink telemetry to the ground station and allows commands to be sent back to the flight controller. Due to the small datarate (57600 kbaud), it is not practical to send fullsize images through this datalink, though a small thumbnail is able to be sent over a 5-10sec time period, if the 5.8GHz radio link is down. This link is very reliable over many 10’s of kilometres of range. This link uses the Rocket M5 modems. In this particular setup, they operate at 1.5 mbps datarate and have an approximate range of 5-8km. This link acts as a network bridge between the ground station and UAV. 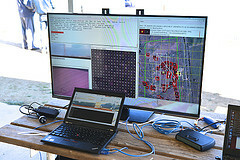 Thus the link carries a number of data items – imagery (when requested), MAVLink telemetry and a SSH session on the on-board computer. This sort of flexibility makes it very easy to debug the UAV whilst flying a test flight. These radios are a bit bulky and do require PoE as the power source, adding a bit of complexity to the setup. These are 3dBi flexible PBC antennas. There are two of them, due to the RFD900 having dual antenna ports. The RFD900 will automatically switch to the antenna with the greater signal strength. The antennas are located on the tailplane, well away from any potential sources of RFI (in addition to being well away from any other RFI-senstive equipment). One antenna is on the horizontal section of the tailplane, the other on the vertical section. 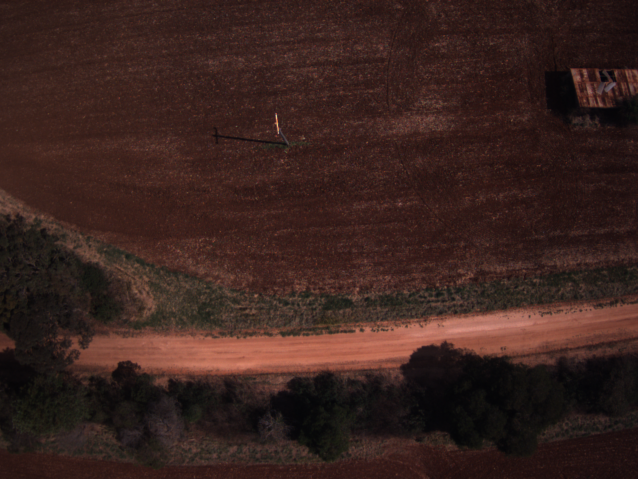 This way, no matter the UAV’s orientation relative to the ground station, the polarisation losses on the radio signal are at a minimum. As with the RFD900 radios, the Rocket M5 also has dual antenna ports. This 5.8GHz antenna, although one physical item, contains 2 differently-polarised antennas. Once again reducing the effects of polarision losses on the radio signal. Due to the large length on the antenna, it could only be mounted vertically in the middle of the fuselage, just behind the wings. A cowling was built in order to reduce drag effects of the antenna. The camera is a PointGrey Chameleon. It has a 1280×960 resolution (1.5 megapixels) with a global shutter and a high sensitivity to light. The global shutter is important due to the high levels of vibration on the UAV (due to the engine). A common rolling shutter camera (most consumer cameras) would result in smearing of the image. It is important that the image is as sharp as possible, in order to make it easier to the image analysis algorithms. 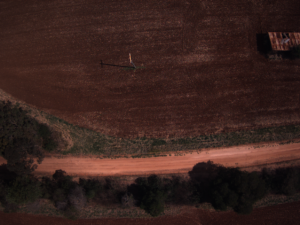 To account for any rolling of the UAV during flight, the camera is roll-stabilised such that it is always point down towards the ground. The servo is connected to the Pixhawk, where the APM:Plane software manages the servo. There is no pitch servo, as it was found during flight testing that the airframe rolls much more than it pitches during flight. There is only enough room in the camera cradle for one servo, so the roll servo is the most effective stabilisation direction. The on-board computer is an Odroid-X2. It is a high performance ARM-based computer with enough ports for our needs. It is similar power to high-end tablets and phones. It’s small size and low power usage make it ideal for UAV’s. It uses eMMC flash memory for the “hard drive”, negating the need for using an additional USB port and the additional bandwidth that entailed. It was found during testing that using a flash memory drive (as the hard drive) and the camera on the USB bus would flood the USB bus to such an extent that it couldn’t keep up with the data transfer. This would result in missing frames of data from the camera. The Odroid ran the Ubuntu operating system, with the MAVProxy and cauv software managing the flight telemetry and image analysis respectively. MAVProxy would take in the telemetry from the Pixhawk and pipe it out through the two radio links. The cuav software would capture imagery (via the camera), analyse the images for any interesting objects and pass thumbnails of these to the ground station. On command, it could send full resolution images to the ground station. All images and logs were saved to the eMMC card during flight, in case of data link loss and for post-flight analysis. There is an active SSH session to the Odroid from the ground station. This allows the ground station to restart or debug any running programs on the Odroid at any stage in the mission. Note the items enclosed by the green box are located at the top of a 4m antenna tower. There are two batteries – a lead acid battery for general ground power and a LiFE battery for the antenna tracker. The lead acid is a general 60Ah 12V type. It is carried in the back of a van and is recharged by the van’s engine. The LiFE powers the servos and control mechanisms for the antenna tracker. The AC inverter provides 240V AC power for the ground station laptops and TV. It is a 400W type and is able to power 2x laptops and a 42″ LCD TV. This supplies 6V DC power to the network switch. As on the UAV, it is a CC BEC. It is easier to supply the 6V directly rather than go though the inverter and back to DC power again. This power supply a CC BEC, powering the Pixhawk and servos on the antenna tracker. These two radios create a datalink between the master GCS computer and the antenna tracker. It sends MAVLink data of the UAV’s current position, so the antenna tracker knows where to point. Due to the short range between the radios, they are run at low power. The antennas for the 433 MHz radios are standard 2 dBi dipole antennas. This is a Pixhawk running the APM:Tracker software. 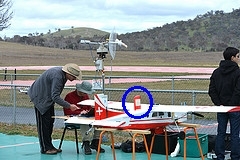 Whilst being fed the UAV’s position from the 433 MHz radio link and knowing it’s own position via a connected GPS module, it controls the pan and tilt servos to point towards the UAV. This provides the antenna tracker’s current position. These are high-powered servos capable of quickly moving the antenna tracker frame (and the associated antennas). To increase accuracy, servos capable of fine control and very little backlash or “slop” are preferable. The ground station network uses static IP addresses and thus requires a network switch. The switch is a standard consumer switch (re-purposed ADSL router modem) with 4 ports – 3 for the laptops and 1 for the 5.8 GHz radio. As with the UAV, this radio is an RFD900, operating in the 915-928MHz band (allowable bands may vary slightly in different countries). It is connected directly to the master GCS laptop. As with the UAV, this link uses the Rocket M5 modems. In this particular setup, they operate at 1.5 mbps datarate and have an approximate range of 5-8km. This is a 28 dBi dual-polarisation dish antenna for the 5.8 GHz radio. Due to the narrow beamwidth of this antenna, it is required to be steered to point to the UAV. There are two of these antennas, mounted in horizontal and vertical directions to reduce the effects of polarisation losses. They have 6 dBi gain and are connected to the 928 MHz radio. This is a standard RC transmitter module (FrSKY type) used for transmitting control signals to the UAV whilst it is in range – usually 500-600m. An “Imaging” laptop for monitoring the image analysis on the UAV. It can also download full-size images for further inspection on demand. All three laptops run the Ubuntu operating system and are otherwise standard consumer laptops. The television is a 42″ LCD TV connected as a second monitor to the master ground station laptop. It displays a moving map of the UAV’s current position and the mission waypoints. The RC transmitter is a FrSky Taranis. The pilot uses it for a manual takeover of the UAV, if required.